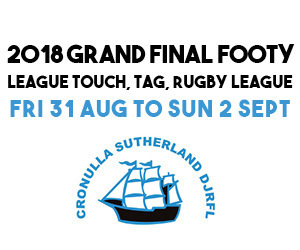 The final weekend of the 2018 JRL Season is coming up with the Grand Finals for Rugby League, League Touch and League Tag occurring on Friday 31 August to Sunday 2 September. League Touch and League Tag will be conducted on Friday afternoon/evening with the Over 35's under lights on Friday evening at Southern Cross Group Stadium. Junior Rugby League games will be held on Saturday. These games are being held across Cronulla High School, Captain Cook Oval and Southern Cross Group Stadium. Senior Rugby League games will be held on Sunday across the two fields across the road from each other - Southern Cross Group Stadium and Captain Cook Oval. All local fixtures have been finalised, some fixtures that are playing out of the district are still being confirmed by other Districts/NSWRL so please stay tuned. For a printable version of the local district games please click here (updated). Away fixtures have also now been confirmed. There will be a FREE Sharks Shuttle Bus that will do the loop between Caringbah>Woolooware>Cronulla Station to Shark Park then around (same as Sharks game day). Best of luck to all players and officials of all teams participating the best of luck and a huge thank you to all of the JRL, Rotary Club volunteers and Club officials that without these people the season and finals events wouldn't occur. Please note: draws are subject to change. These are correct as of 2pm Tuesday, 28 August 2018.